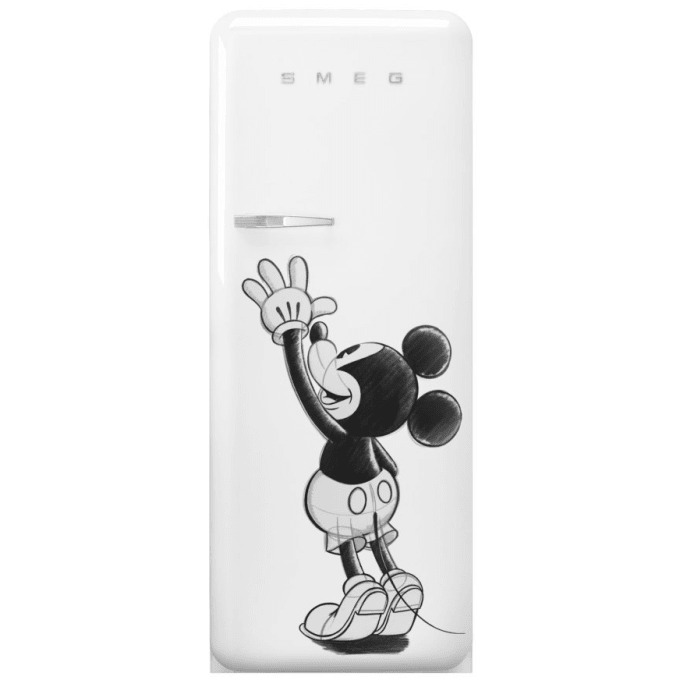 For the 90th birthday of the world's most famous comic figure, Disney and Smeg present a design highlight: the white FAB28 retro refrigerator with an original Mickey drawing in limited edition. The special edition is expected to be available from 10/2019. Please contact us for a pre-order. Following on from previous collaborations with Dolce&Gabbana, Mini and Veuve Cliquot and many others, Smeg has partnered with Disney for its latest collaboration. To celebrate the special nature of the partnership, there will only be a total of 90 fridges made for the limited edition collection. Smeg’s iconic FAB28 fridge is brought to life by an original drawing featuring Disney’s most iconic character, Mickey Mouse, who is also celebrating his milestone 90th anniversary this year. Both brands are synonymous with bringing the family together. For Smeg, at the heart of the company lies a focus on food, family and entertaining. Meanwhile for Disney, at its core lies the ability to bring people of all ages together, united in a sense of fun, laughter, optimism and hope.Featuring a ‘True Original’ bespoke sketch of Mickey, each of the limited edition 90 FAB28RDMM3 fridges include an endearing image of Mickey playfully reaching for the fridge’s handle. 90 fridges will be produced, one for each year since Mickey’s debut back in 1928 making this a true collector’s item. Each fridge is decorated with a limited edition silver plaque signifying it’s unique number. Aesthetically speaking, the FAB28 is Smeg’s most widely recognised design. Immediately identifiable due to its soft curves and 50s-inspired design, it paved the way to a refrigerator revolution in the late 1990s. Since then, it has become a global phenomenon. The interior benefits from adjustable glass shelves, chrome shelving supports, metal wine racks, LED strip lights, an ice compartment and a Life Plus drawer, which keeps fruit and veg fresher for longer. Each FAB28 provides a total gross capacity of 281L and offers an A+++ energy rating. In addition, Smeg recently upgraded all of its FAB fridges to include a metal back.Born from an exciting collaboration between two creative and iconic brands, the FAB28RDMM3 is available in Europe until stock lasts. Do you have a question about "FAB28 Mickey Mouse"? How can we contact you?